Where do you look for wildlife? It depends on what you want to see. No one expects to find an alligator in a desert arroyo or a manatee in a mountain lake. But it’s surprising how many don’t notice that even small changes in surroundings can mean major changes in the creatures that live there. Acorn Woodpeckers know that oaks from little acorns grow because that’s how they make their living. If you want to see these clown-faced hammerheads, search for foothill woodlands where oak trees predominate. Meadowlarks sing their songs from fence posts in meadows and grasslands, and build their nests in the same habitat. To hear their melodies you leave the foothills and drive down to the flats. These birds got their names from where they are found, but almost all wildlife has a specific combination of living conditions to which they have adapted. The migrants might only restrict themselves to these areas during certain times of year, but even the long distance travelers tend to look for similar conditions when following the seasons. We’ve been fascinated by Nature’s Neighborhoods since we started watching wildlife many years ago, and occasionally try to get a bit more scientific in our explorations. For example, this year we discovered that the state of California has designated 59 separate relationship zones to help predict which wildlife species can be expected in a specific location. But when we had to choose between memorizing these wildlife habitats, or going out and actually watching the critters we love, it was an easy decision. Thank goodness for C. Hart Merriam. Merriam, one of the founders of the National Geographic Society, worked for the Department of Agriculture in the late 1800s, and he developed a habitat classification system known as Life Zones. Although some consider his system outdated and too imprecise, with some minor modifications it works well in the Western United States where we spend much of our time. Another advantage — instead of 59 zones, there are six. Merriam used altitudinal differences in laying out his plan, recognizing that there is a close relationship between changes in altitude and changes in latitude (north/south movement.) Climbing 1,000 feet up a mountain is about the same as driving 600 miles north. In each case the average temperature will fall by about three degrees, and the changes in rainfall will be similar. That means that the plant life will also change, as will the local inhabitants. If you want to see more animals, visit more altitudes. The original work was done in Arizona, where Merriam and his group explored and classified the plants and animals from the upper reaches of the San Francisco Peaks to the bottom of the Grand Canyon, a vertical drop of two miles in slightly more than 50 horizontal miles. One year we made this journey ourselves. We have to confess, we did the mountain climbing in our motorhome, but ended with a backpacking trip to the canyon bottom. The Life Zone concept becomes so much easier to understand when you can see the changes occur over a short period of time. This year we’re planning a similar adventure, sparked by reading the Handbook of Yosemite National Park, written in 1921. The chapter titled “Lifezones of the Yosemite Region” describes a trip starting from California’s central valley and traveling to the highest road-accessible point in Yosemite National Park. This occurs at the eastern entrance to the park, at Tioga Pass, the highest vehicle pass in California at 9,941 feet. The chapter uses Merriam’s zones as guideposts along the journey, pointing out the various types of trees, mammals, and birds you are likely to encounter on the trip. Of course, being written in the 1920s means the names of the some of the creatures have changed. Blue-fronted Jay became Stellar’s Jay, and Calavaras Warbler is now the Nashville Warbler. And some of the names are especially intriguing. We’re certainly hoping to see a Mariposa Meadow Mouse somewhere along our journey. The lowest two zones are named Lower and Upper Sonoran. In the west they tend to be arid deserts and grasslands, ranging upwards into the pinyon/juniper and oak regions. The Upper Sonoran extends from about 3,500 feet to 6,500 feet, and normally has less than 20 inches of rainfall each year. One of the noisiest birds of the Upper Sonoran is the Scrub Jay, and the jay family provides a perfect example of the changes you’ll find with altitude (or latitude) gain. As you climb up to and beyond the Transition Zone (6,000 feet to 8,500 feet) the Scrub Jay starts to disappear and the Stellar’s Jay takes its place. The difference seems to be one of moisture. Scrub Jays can survive in a dryer area, and as we go up, there is more rainfall. Of course birds are not stationary creatures; occasionally we’ll find Stellar’s Jays as low as 2,000 feet during some winters. But that’s the exception rather than the rule. The Transition Zone in the west is more or less defined by the Ponderosa Pine Forest, a major timber crop and a great hiking altitude. It’s high enough to be comfortable in the summer, and the trees tend to be widely spaced, allowing you to walk cross-country without fighting through underbrush. And if it gets really hot, move on up to the Canadian (8,000-9,500 feet) or Hudsonian (9,500-11,500 feet) Zones. Each of these Zones have different tree and animal occupants, so being able to identify the most common trees in an area will give you a good idea of your altitude and the wildlife to expect there. That’s why a tree guide can be important to a bird and mammal watcher. The highest zone, the Arctic-Alpine Zone (over 11,500 feet) is identified by the absence of trees. There may be some stunted trees struggling to survive, but for the most part you’ll be looking down on the trees from above. It’s not actually the cold that keeps the trees from thriving here, but the shortness of the growing season. 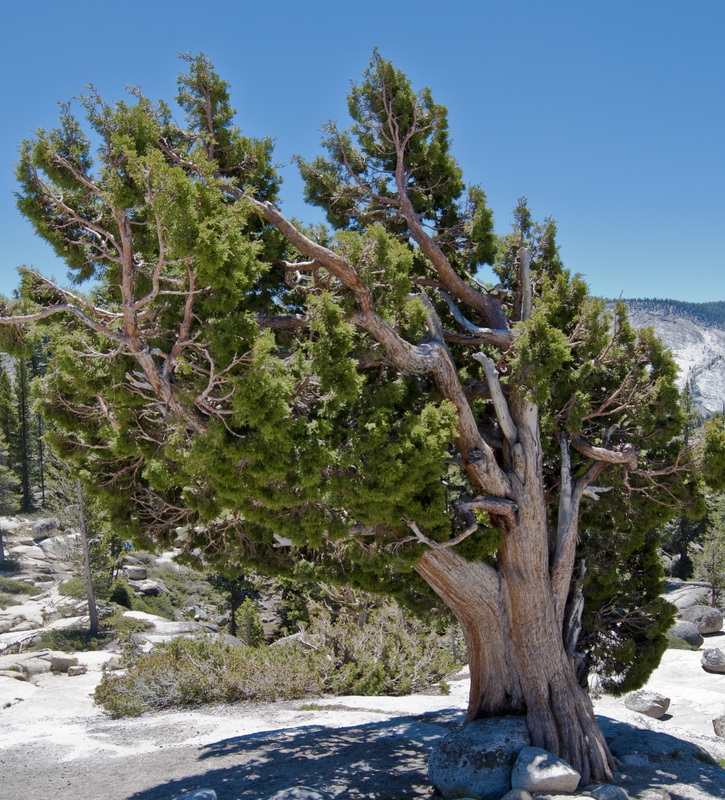 Many tree species can survive extreme cold. They just don’t have enough summer to build the surplus energy to last through long winters. If we’re lucky, this month we’ll be spending some serious time on this passage over the Sierra Nevada range. Why the luck? Because the road over Tioga Pass is only open an average of 155 days a year, and the typical opening date is towards the end of May. This month or next we’ll be searching the Arctic-Alpine Zone for the Gray-crowned Rosy-Finch, one of the only birds crazy enough to spend most of its time at this altitude. We know it should be there. After all, C. Hart Merriam told us so. ANY purchase from Amazon through this link helps support Our Window on Nature.